I couldn’t agree more. Terry Fallis, well-known for his previous novels such as Up And Down, The High Road, and the political satire The Best Laid Plans, (now a television series), brings us a brand new book that is bound to win our hearts again. No Relation is a book filled with humour and intelligence, plus a character that remains close to my heart -- especially since we share the same professional affinity: copywriting and writing. Imagine if you were named Earnest Hemmingway! Even with the extra “a” and “m” you won’t be able to distance yourself from one of the greatest writers of our time. But what if, you had that name and also wanted to become a writer? Chuckles may ensue; subtle winks behind your back. Not to mention, you may even be haunted by the success of the famous author and feel overshadowed. This is one of the many dilemmas that Hem (let’s call him that to make things simpler) is faced with after he is fired from his job at an ad agency. It is a day when the universe seems to be against this normally non-confrontational chap. Upset and disgruntled, he arrives home to find out that his day only seems to be getting worse. His girlfriend leaves him, plus he’s lost his wallet. Hoping to be productive, Hem goes to the DMV to get another driving license, but without identification he finds himself in a bit of a conundrum. Bad luck escalates (once again as a result of his unfortunate name) and he is almost on the verge of losing one more thing in the process – his sanity. 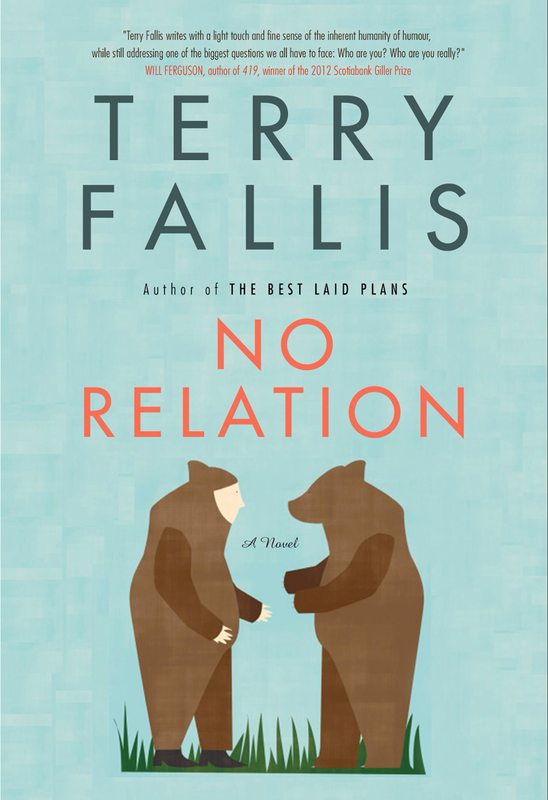 Terry Fallis has been referred to as CanLit’s crowned king of chuckles. And, it’s easy to see why. With a sharp wit and characters that everyone can identify with, he has a clever way of engaging his reader. What I loved about the book is all the Hemingway-related places Hem wants to visit to overcome his writing block. Yes, even Hemingway’s Restaurant and Bar in Yorkville Toronto, is explored, although Hem admits he should have done a bit of proper investigating before heading out on that journey. Whatever the case, I will be going through No Relation again and making my own “Places That Relate To Hemmingway” bucket-list. Then I will embark on a full-on, no-holds-barred Hemingway jamboree; one that will include an afternoon of drinking wine and cheese in the Luxembourg Gardens. No Relation is published by McClelland & Stewart, a division of Random House of Canada, a Penguin Random House Company. Hehe I just reviewed this on my blog as well! I laughed so hard about Hem's outburst at the DMV! This is definitely a great book to read when you're having a bad day. Great review! Indeed. The YouTube DMV disaster was so indicative of today's norm. You never know who's got their cell phone camera on. Enjoyed your review too. Terry Fallis is on a roll. Happy to have ridden the chuckle train.